Since its start in September, the Middle School's Community Service Club has accomplished much. The Club, which meets on the 2nd and 4th Thursday of the month from 2-3pm, has completed a series of projects to benefit the SPCA, the St. Petersburg Free Clinic’s Food Bank, Meals on Wheels, and American Red Cross’ Holiday Mail for Heroes, as well as increase awareness in the Middle School about the importance of recycling. Last week’s projects focused on providing a little holiday cheer through decorated placemats for those homebound and receiving Meals on Wheels deliveries, and through holiday greeting cards for members of the military stationed away from home to be distributed via the American Red Cross’ Holiday Mail for Heroes program. The group has received the Hasbro generationOn Clubs Start-Up Grant in recognition of the work by its membership, 20+ students, as well as its four faculty and staff advisors. The funds will be used for supplies to support the Club’s projects through the remainder of the school year. 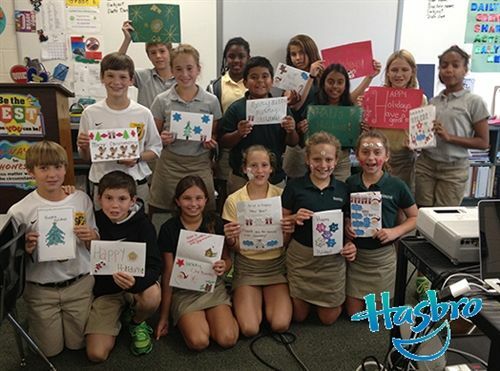 The Club, which is registered with generationOn as the “Shorecrest Kids Care Club,” shares its service-project experiences and photos at the organization’s Web site so other clubs across the country can be inspired by project ideas: http://www.generationon.org/service-stories/8743. The Community Service Club has been a popular choice among the students in grades 5–8, and a new group of members is expected to continue the work from February - May.